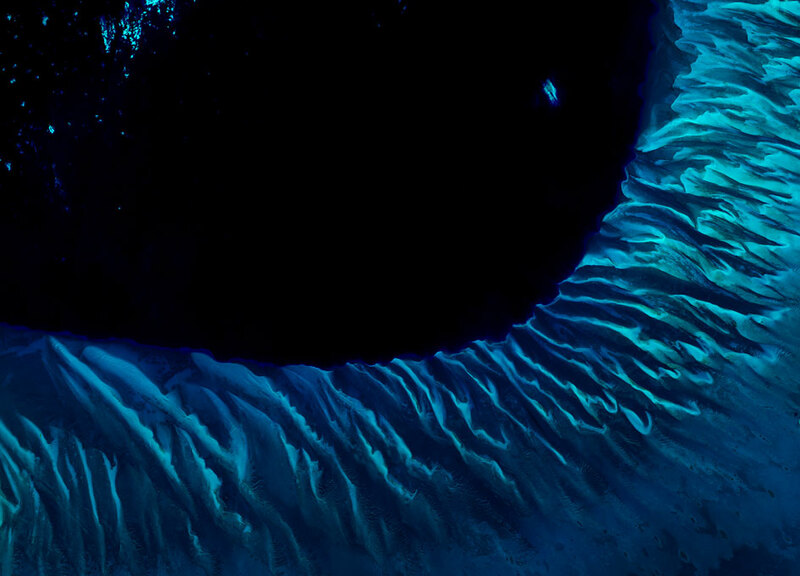 Underwater structures of the Great Bahamas Bank are pictured in this image from the Landsat-8 satellite on 5 February. Sitting north of Cuba, the bank is made of limestone - mainly from the skeletal fragments of marine organisms - that has been accumulating for over 100 million years. Currents sculpted these underwater sediments into the wavy pattern we see along the bottom of the image, just a few metres deep. We can clearly see where the shallow waters drop off into the deep, dark water of an area known as the Tongue of the Ocean. With depths of up to about 4000 m, this trench surrounded by islands, reefs and shoals has an opening to the Atlantic Ocean at its northern end (not pictured). The trench was carved during the last Ice Age when the land was still above sea level and exposed to erosion from draining rainwater. As the Ice Age ended and the massive ice sheets across the globe melted, global sea levels rose and flooded the canyon. Over the deep Tongue we can see a few sparse clouds. - Download full high resolution image.